What Causes the “Green” Water in Lakes, Rivers, Streams, and Reservoirs? When our waters turn Green look at the nutrients in the outfall! Nutrients such as phosphates and nitrogen are the primary culprits of eutrophication in fresh water bodies. Direct effluent, sewage, and chemical discharge into estuaries and streams are the primary causes of degradation of our downstream water quality. Phosphates in sewage effluent are caused from phosphate containing detergents and soaps, and provide vital nutrients essential for algae blooms in shallow fresh water bodies. The addition of nitrogen accelerates the growth process of algae and other unwanted plants in fresh water. Put the two together and you have the perfect environment for eutrophication. TCEQ is currently evaluating limitations and potential treatment policies which will impact how our cities and towns build and renew wastewater and surface water treatment facilities. A recent presentation prepared by TCEQ and available through TWUA, discussed the impact excessive phosphorous and nitrogen in our water bodies have across the county. 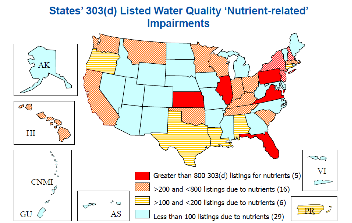 The following illustration shows the areas within the U.S. of concern caused by nutrient contamination. 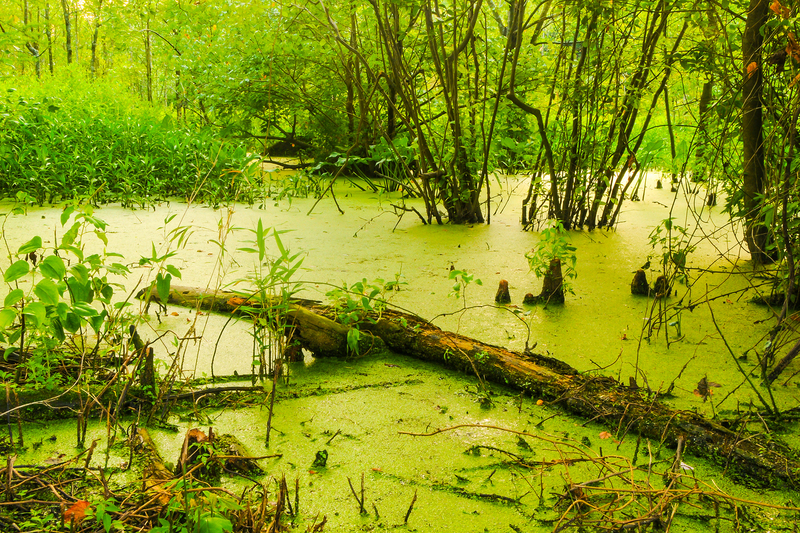 Eutrophication continues to pose problems for wastewater systems and stormwater runoff across the country. Understanding where these contaminants come from and how best to control their discharge to fresh water is critical to managing their effects on our environment. How are these contaminants proposed to be regulated? The EPA and TCEQ have been busy developing numeric metrics to measure the degree of contamination from Phosphates and Nitrogen. However, determining the ratios that result in the development of eutrophication is proving challenging. Both nutrients are essential to the growth of aquatic plants and life, but determining the tipping point from healthy to toxic is not easily identified. The depth of water, temperature, type of bottom—sandy loam or rock—all have a significant influence on the degree of plant growth that can result. The EPA recognizes that “excessive nitrogen and phosphorus that washes into water bodies and is released into the air are often the direct result of human activities.” Establishing watershed load reduction goals, development of watershed-scale plans in agricultural areas, setting minimum criteria for septic systems and limits on phosphorus in detergents and lawn fertilizers, and regular verification that load reduction practices are in place are just a few of the regulations being considered. Today, it is up to our cities and states to develop partnerships with environmental agencies, land owners, concentrated animal feeding operations, and private sector partners to reduce or eliminate toxic discharges into our groundwater, rivers, and estuaries. Currently, TCEQ is in the process of promulgating the rules and requirements for limits for these nutrients; the proposed issue date is 2017. What types of bodies of water will regulations protect? TCEQ is proposing regulations that would cover all types of water, including reservoirs, which are subject to the runoff carrying nitrogen and phosphates from fertilizers. Other contaminants are also carried in the runoff, but the focus has been eutrophication-causing nutrients. Currently, there isn’t a single non-point discharge point to collectively measure sources of pollution for rivers and streams—making runoff control extremely difficult. Wastewater discharges are much easier to identify and control so it is anticipated that the first nutrient limits to be issued will be tied to applications for municipal wastewater permits. How will this affect my permit? Based on current regulations, environmental trends, and a great deal of available research and documentation, it is anticipated that new and/or renewal permits will include nitrogen and phosphorus limits for wastewater treatment and effluent reuse. The exact limit will depend on the receiving stream or body of water. For example, estuaries where sea grass is prevalent will be a targeted area to limit nitrogen loading for the protection of the grasses as well as the water quality. Other streams, rivers and reservoirs will be assessed on a case by case basis. What can be done to help control nitrogen and phosphates in our wastewater? Education of the public on the effects these nutrients have on our stream, rivers and reservoirs is the first step. A great impact can be realized by reducing or eliminating the dependence upon the use of fertilizers and weed control chemicals on our lawns, plants, and green spaces. In areas where runoff from a watershed is problematic, creating natural filters to capture as much of the runoff prior to reaching the water body is one option. We have already seen significant increases in wastewater treatment costs and as nutrient restrictions are added, additional treatments will increase costs across the board. Permits will be written to include limits on phosphates, phosphorus, and tighter limits for nitrogen. Additionally, more control measures for the major watersheds surrounding the major reservoirs in Texas will be issued. Public education will be the direction cities and municipalities will need to take to inform their residents of the importance of using detergents and fertilizers that limit phosphates and nitrogen releases. Enhanced wastewater treatment will be the result of impending nutrient limits. As reuse of effluent becomes more prevalent, more advanced treatment of wastewater will be required. Reducing nutrient loading will reduce the cost of treatment that helps all users.